This natural product with Lavender essential oil and Sea Salt has a stimulating effect on the skin, removing dead skin cells and through this action stimulates a glowing complexion. It refreshes the skin while stimulating blood circulation. 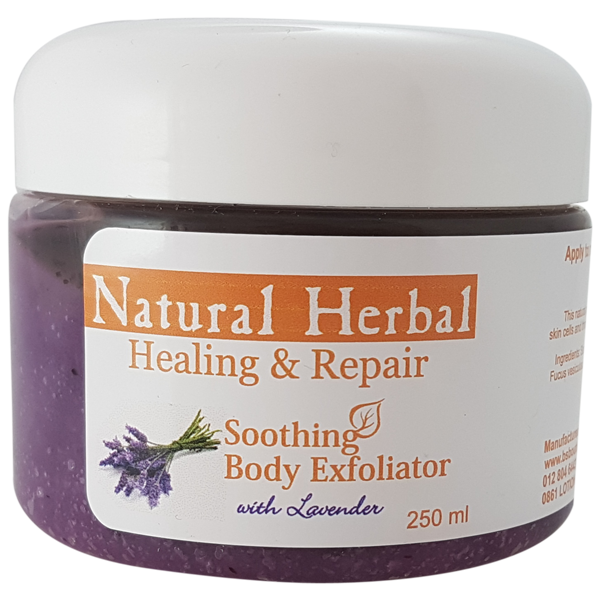 Healing & Repair Range Body Scrub with Lavender contains extracts of Sea Weeds (Bladderwack, Sea tangles, Japenese seaweed and Gulf weed), all of which condition, hydrate, detoxify and softens the skin. Seaweed extract also protects the skin from free radical damage. Lavender oil relieves aching muscles, while also soothing some skin conditions such as acne and burns. Maris Sal is salt from the dead sea, and contains minerals contributing to detoxifying the skin, clearing dead skin cells and smoothing out the skin. Apply to moist skin and move in circular motions to exfoliate and soothe the skin. Rinse with warm water.